D2r installed mirror around the room for representing the space's expansion and continuity. 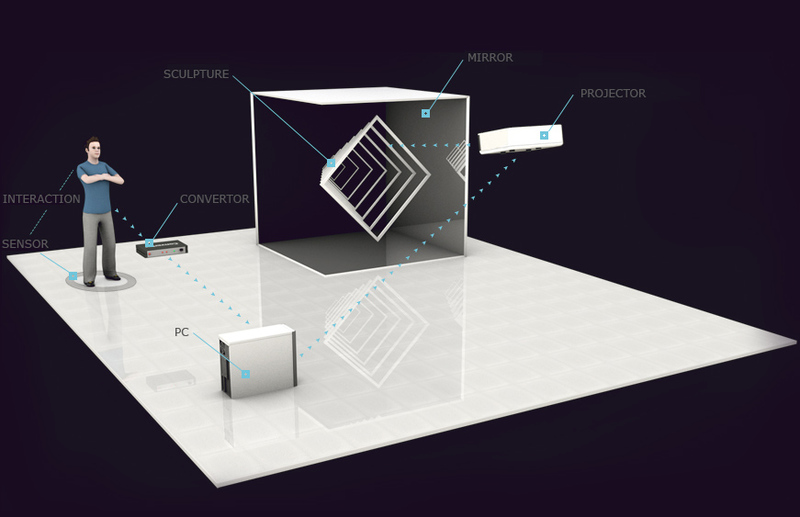 And projection Mapping on mirror space and play over and over again for expressing duplication, fusion, reproduction and infinite repetition. 2011 Gwangju Design Biennale's Director Lee Hyo-sang chosen 'Immersive virtual by D2r' as 'Works that you have to see - 10 selected'. Also audience were surprised by space design of keep replicating, fusing and reproducing. 'Immersive virtual''s structures were placed at regular intervals for illusion. It attempt to destroy the space's limit and wanted to show new expansion of space to the audience. Audience can feel two forms of simulation to presents a immersive virtual environment. We using a mirror vision and repeating sound for maximizing the Immersion. D2r tried to expressing the differentiation of Brand Identity by visual design of the product characteristics. Regardless of location, 3D Mapping on any corporate and brand symbol, logo, objects can be installed. 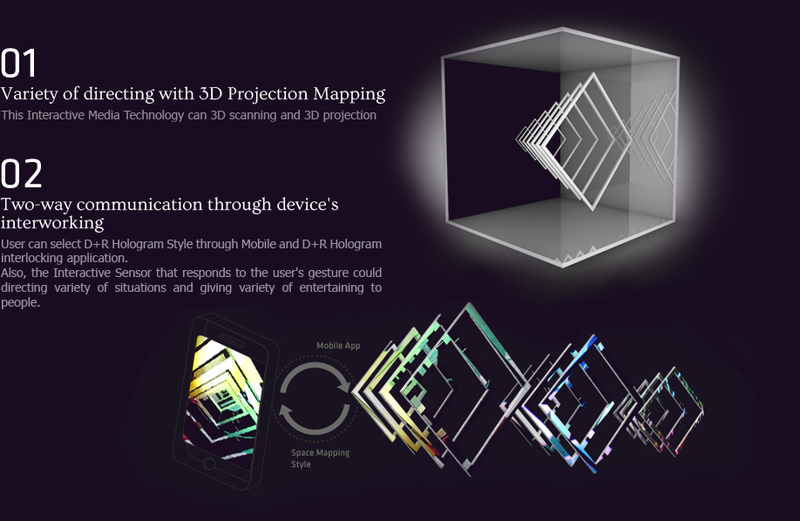 Interactive, through the device of Mobile, Interactive Sensor, Etc. User can select SPACE MAPPING Style by mobile and D + R pace Mapping conjunction as applications. Interactive Sensor responds to the user's gestures and making a variety of situations in the space. D2e using four sides of the mirror for Infinite loop by creating a new space for Users to experience immersion and spreading seemed like they're stucking.